The working title for this new full‑range 2.1 monitor system from Blue Sky was the Mid Blue, because it plugs the gap in their product line between the Sky System One and their flagship Big Blue. It comprises two Sat 8 three‑way active satellites and a single Sub 212 subwoofer (both of which are unported, infinite‑baffle designs), and weighs in at around 85kg in total. It hardly seems worth insuring the system against theft, as it would take some kind of 'B'‑movie monster to make off with it in a hurry — and most policies usually exclude Acts of Godzilla anyway! Each Sat 8 combines eight‑inch and four‑inch hemispherical drivers, plus a ring‑radiator tweeter. The slots either side of the tweeter aren't porting vents — they don't actually breach the cabinet — but are stuffed with acoustic absorption material to soak up high‑frequency diffractions and thereby keep high‑end horizontal dispersion more even. As you can see from the pictures, the tweeter and mid‑range driver are mounted on a separate plate, and this can be rotated to maintain this improved horizontal dispersion when mounting the monitors on their sides. The Sub 212 looks, at first glance, as if it has just a single driver, but there's a second one mounted in the bottom of the cabinet, facing inwards, and the pair operate in a push‑pull configuration: both drivers push away from the cabinet at the same time, but because one cone moves towards its magnet while the other moves away from it, this gives more balanced response to positive and negative waveform excursions, reducing even‑harmonic distortion. With 100W per driver in the satellites, and a further 400W propelling the subwoofer, you're unlikely to run out of level in any realistic studio situation, and my ears certainly waved the white flag well before these monitors showed the slightest signs of strain. In addition to a fully variable overall gain control, the Sat 8's rear amplifier panel provides ±3dB gain for each of the three drivers, so you can tailor the tone to your personal taste, and up to a further 11dB of low‑end cut to compensate for the effects of soffit‑mounting. 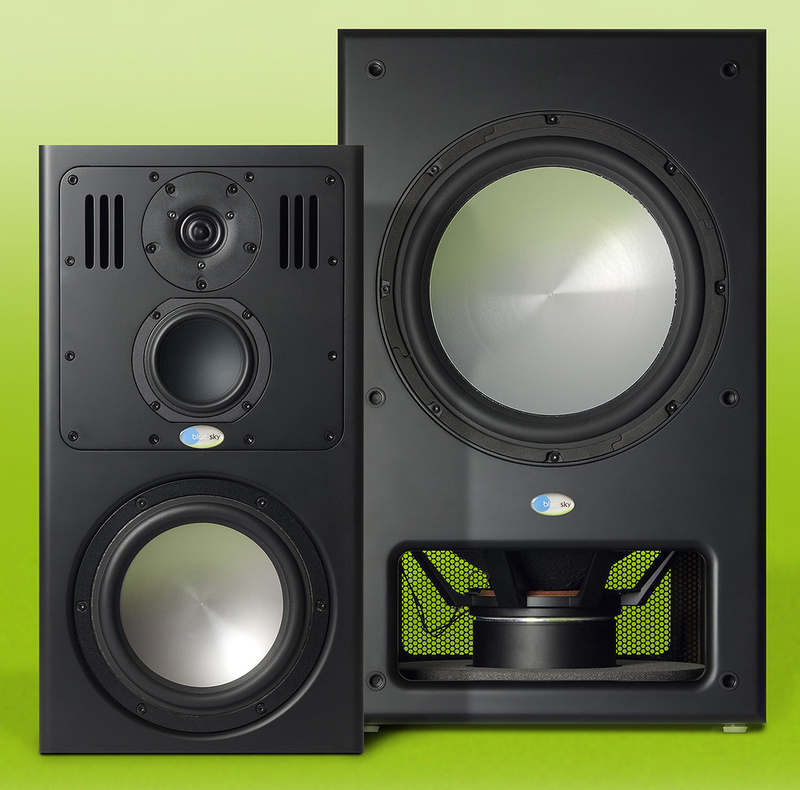 The subwoofer's controls are simpler, with just gain and polarity inversion. Stereo bass‑management for the system is built into the subwoofer, so you need to connect the satellites via that to cross over the low end correctly. Both the Sat 8 and Sub 212 can, of course, also be used in surround setups, but you'll need a separate bass‑management controller. One of the advantages of 2.1 designs is that they're a little easier to place in the room than a pair of full‑range stereo speakers — you can choose the best subwoofer location according to the evenness of the bass response, pretty much irrespective of the positions of the satellites. That said, I don't personally like having time delays between my subwoofer and either satellite, so I went for a fairly traditional mid‑satellites location in my room, using the time‑honed position of my own Blue Sky Pro Desk system's subwoofer as a guide and experimenting from there. Blue Sky provide special band‑restricted noise signals for calibrating the system. You'll need your own SPL meter to carry out the calibration, but it only takes a few minutes to complete. In positioning the satellites, remember that this is a midfield system, so try to distance it at least a couple of metres from the listening position, so that the output of the three drivers can blend sufficiently. The rear panel of the chunky 212 Subwoofer, dominated by the heat sink. Starting my listening tests with all the frequency contouring controls at unity, I was surprised to find, given my experience of the tonal forwardness of Blue Sky's smaller systems, that the overall tone of the Sat 8 was fairly warm and reserved. Although this means that you have to listen a little more closely to focus on the high‑end details, the positive flip‑side of this is that you can turn these babies well up without exfoliating your ear canals, where harder‑sounding monitors will quickly give you listening fatigue at those kinds of levels. Of course, the rear‑panel switches provide a wide range of frequency tailoring as well, and I personally selected 1dB less woofer and 1dB more tweeter, to bring the tone closer to my own preferences. 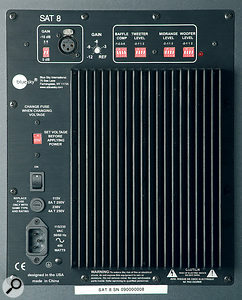 The next thing that quickly became apparent was that, although the absorptive slots do seem to make the listening position less critical in the horizontal plane, the vertical frequency dispersion is quite narrow, so you need to make sure that the Sat 8's drivers are carefully angled towards your ears. Whatever anyone tells you, there's no truly neutral‑sounding set of monitors, so you'll always have to get used to any new speaker's tone before you can work with it. A more important issue, though, is that once your ear has acclimatised, your monitors need to be capable of throwing the comparative differences between sounds into stark relief — for example, when you're referencing your work against that of the market competition. This is something that these speakers excel at, and I was struck by how clearly they communicated the spectral fingerprints of different mixes and, indeed, the individual mixing styles of my favourite engineers. Despite exhibiting few aggressive tonal tendencies, these speakers are nonetheless seriously fast, especially at coming to a stop, and here's where Blue Sky's specialism in closed‑box design really makes its presence felt. Not only can you hear precisely what's going on at the front end of your percussion sounds (Katy Perry's 'Hot & Cold' practically draws blood! ), but also the exact attributes of instrument sustains, and how those interact with any reverb you may be applying (even when it's just short ambience), because there's very little resonance in the speaker causing frequencies to smudge over others in the time domain. I imagine that the lack of frequency resonances is also responsible for this speaker's willingness to separate out all the individual layers in a complex mix for individual scrutiny (something like Outkast's 'Bow Tie' is a revelation, for instance), and to maximise the depth of field: sounds with reverb recede as they should, while those that are dry shoot right out front. In fact these speakers are so good at delivering dry sounds that Kanye West's 'Breathe In, Breathe Out', which is on my reference CD because it's mixed without a scrap of reverb, made me feel uncomfortably claustrophobic! The down side of all this for some users, however, will be that there is not one ounce of flattery on offer. These speakers are almost brutal in their frankness; they tell you what's there, and they don't give a damn how you feel about it! While this makes them powerful analytical tools, they'll take some getting used to if you're not used to the qualities of closed‑box systems. For my part, I already use unported monitors almost exclusively, so I appreciate what they offer, and this system has those qualities in spades. There's a lot of power behind the subwoofer, and it shows in the effortlessness with which the low end plummets to the centre of the earth. It does pay to spend a little time adjusting the subwoofer level by ear, even if you've calibrated it using an SPL meter, but when you get that level right the result is all the extension you'll ever need without any sense of fuss. In this price range, though, this isn't anything much to write home about. What is spectacular about the Sub 212, though, is the way it can separate out what's going on down there. Tracks like Eminem's 'Soldier', Skunk Anansie's 'Infidelity', and especially Finlay Quaye's 'Even After All' all feature low‑end layering, which can lack focus even on some monster studio monitoring systems; the Sub 212 manages to feel both muscular and nimble on all of them. These are first‑rate professional monitors, but they may not be to everyone's taste. They'd be well suited to mastering applications, on account of their ability to really X‑ray the innards of a mix and resolve small tonal nuances, while mix engineers would also be well served, as long as care was taken to reference work adequately on lower‑bandwidth and less well‑controlled listening equipment. For typical 'big monitor' tracking duties, though, you should think a bit more carefully, because real‑world musicians and their assorted hangers‑on are unlikely to warm as readily to such tact‑free critique, lacking, as it does, the comforting hype of typical home hi‑fi systems and budget monitors. In this price range, there's a lot of choice of ported monitors, but if sealed‑box characteristics are your poison, it would certainly be worth comparing this Blue Sky system with something from Miller & Kreisel, a company who've also invested a great deal of R&D in this area and have a reputation to match. Excellent transmission of subtle tonal differences, internal mix details, and depth of field. Faster than a cheetah with its pants on fire — even at the low end. Vertical high‑frequency dispersion feels rather narrow. The forensic detail won't suit everyone. If you need high‑precision mixing and mastering tools that excel with percussive styles and won't flatter your mixes, this system is worth your very serious consideration, if it's within your budget. For general‑purpose studio playback, however, something more soft‑focus will probably win you more friends. Sat 8s £3294.91 per pair; Sub 212 £1647.46. Prices include VAT. 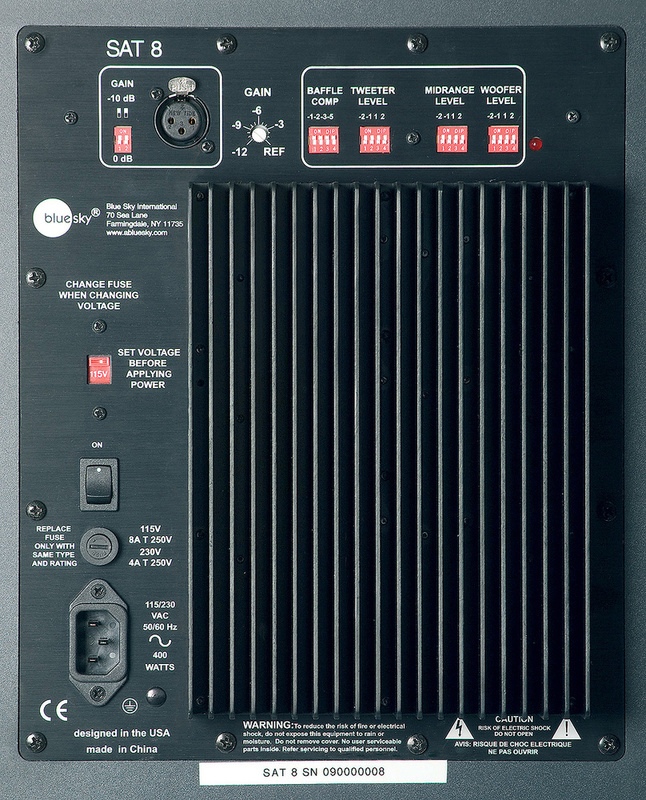 Polar Audio +44 (0)1444 258258. Sat 8 $3500 per pair. Sub 212 £1750 per speaker. Blue Sky +1 516 249 1399.